I would like to clarify one thing before anyone starts calling me a racist: I am not using the word expatriate in this article only because I am a white, North European immigrant, but this story is about a genuine expatriate deal when a company from my home country, Finland, sent me to work overseas for a certain, fixed period of time, with the intention of returning me back home once the assignment abroad had come to an end. This is one of the many ways to describe an expatriate or a business expatriate. The organisation hiring me in The Netherlands was so-called retail alliance jointly owned by ten different European retailers. Our job was to save these individual retailers money by bringing their decision-makers around the same table, giving them a platform for sharing knowledge, combining their purchase volumes and harmonising their requirements. What a brilliant idea! And did these companies save money when the projects were conducted successfully? They saved millions and millions. A great position to be at such a young age that definitely made me a pro-European and shaped me business-wise. Yet, behind those positive results to reach sky-high cost savings was often a strenuous, political process where great people skills, fluent communication and understanding of multiculturalism and diplomacy ruled. I quickly learned about the business environment in Europe that: Finns don’t talk, but email; Swedes talk, but can’t decide; Danish talk fast like they have just swallowed a hot potato; Spanish and Italians talk loudly; and English talk after a couple of pints (not sure how Brexit is affecting this though). Finding a common ground with all nationalities took time and effort. Sometimes comfort, egos or strong local ties stood in the way of conducting global business. Secret trade deals with someone’s neighbour, old friend or blood relative were often the real reasons behind any reluctance to cooperate on a wider scale. The other times, national preferences that were deeply ingrained in the belief systems of the locals and changing those, even in the name of saving everyone money, was a challenge and sometimes not on the table to be negotiated. The most open-minded and brave often won in this game, whereas the old-fashioned and stagnated lost. After a huge, sometimes painful, learning curve about international business, I did manage to earn my champagne moments, where an individual trade manager was congratulated by the directors and quality bottles of bubbly were opened to celebrate a project that had saved the retailers more than the landmark of one million euros. To receive credit like this was important for the self-esteem of a fledgling corporate worker like myself. Yet as glorious as these moments may sound like, a peculiar awkwardness sometimes prevailed when the entire office staff were dragged from their duties behind the desks and they had to form a semi-circle in any of the available meeting rooms. A few smiles and glances were exchanged before the results were announced and colleagues could sink their lips into that expensive champagne. Once the glasses were empty, I always sensed the urgency from everyone to return to the comfort of their computer screens. Or was it just me, a Finn, smoothly wanting to avoid social situations? Within the second half of my assignment, I also got to implement the first, successful online auctions with a global supplier pool in categories never done before. I was finally filling my own shoes. In the end, while training Freek, my Dutch successor, I realised how extensive my knowledge of international trade had become – and I also started feeling less anti about my own first name. What I later heard that Freek was nothing like his peculiar name suggested, as in a very short period of time, he did really up the Antti, got promoted and went to manage the entire department. My time as a trade manager left me with such a deep wounds that still today, years later, I sometimes wake up in the middle of the night thinking how to make Europeans work better together. EU politicians obviously have been too keen to expand the supercontinent too fast. The knowledge and expertise between governments and businesses can always be shared even when the movement of people is limited. Once the economy and wealth of two countries are relatively equal, then why not break the walls and open borders. But until then, let’s just trade freely and spread knowledge without reservations. As an individual, my expatriate assignment was a financial jackpot. I got to live in a big house, drive a new car and travel around the world for business and pleasure. 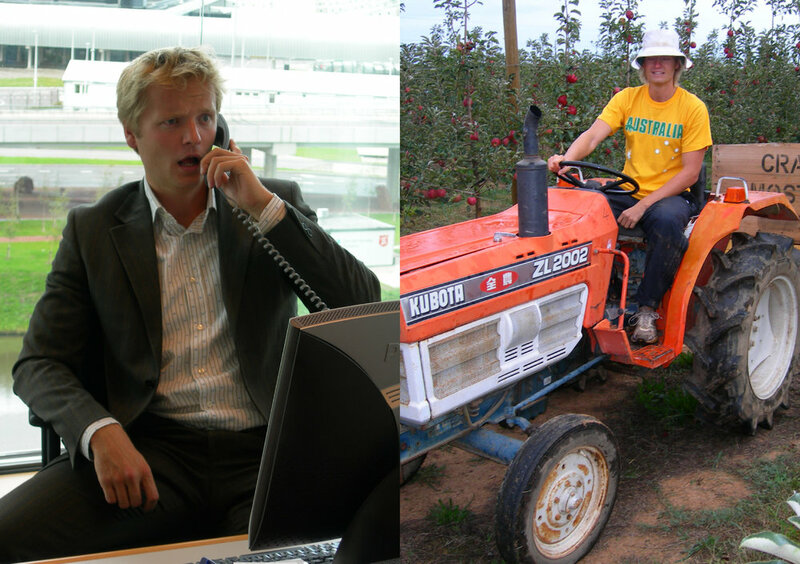 However, rather than returning back to my home country as my contract had stated, I decided to leave all this corporate success behind and soon I found myself on the other side of the world driving a tractor around an orchard while picking up some Pink Ladies along the way. What may have caused my dramatic drop along the retail food chain? Did I experience a complete burn-out, brain damage or enlightenment? Or did I just depart on a privileged journey - typical to the Western middle class to go and redefine themselves, preferably somewhere warm? One thing never changed though: people still call me “an expatriate” sometimes.